This Left Handed putter has superior feel due to a soft carbon-steel body. Better target direction provided by the unique dual sight lines. Improved accuarcy with polar heel-toe weighting which reduces head twist from off-center hits. This elegant Left Hand AT-40 THOMAS Putter has been referred to as "The Dream Putter" with its high level of custom-ability, one-piece construction, jewelry appearance, CNC cutting, Champagne finish, and impeccable performance. The Thomas AT-40 putters are precision instruments of uncompromising feel, control and performance. Inspired by personal statements of tour players, the artistically designed AT-40 offers computer designed and optimized profiles, weight distribution, and neck angles. The AT-40 sports a distinguished Shot-Peened Champagne Chrome Plating, which delivers a crisp, solid feel at impact. Each putter is custom built to your personal height, build, hand size, loft, and lie specifications. Traditionally, putters have been manufactured by forming the putter head and hosel piece separate, then welding them together. 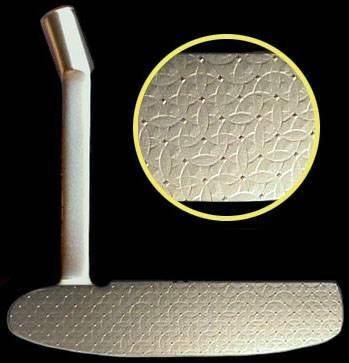 The tremendous amount of heat applied to the components in this process, distorted the characteristics of the metal, creating hot and chilled spots throughout the putter head. This inconsistent structure of the metal would then produce a ball reaction among a random variation of sweet and dead zones that differed in size and location from club to club. 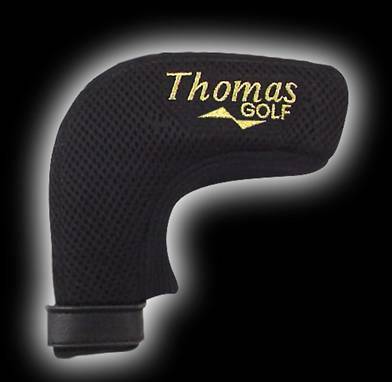 Thomas has eliminated the two-piece construction process and random heat distortion dead zones, by skillfully deriving the entire putter head and hosel as one whole piece from a solid block of steel. 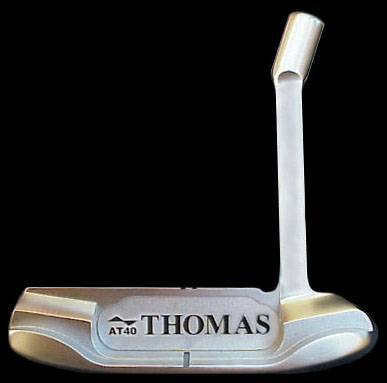 The elite Thomas AT-40 putter was achieved by incorporating the latest concepts and technologies from the manufacturing industry into the golf industry. We used Computer-Numerical-Control (CNC) to finish the head's details of form, balance, and perfect face flatness. Then, utilizing a jeweler's tool on the face of the putter, the AT-40 receives approximately 100 independent cuts into the face of the putter. The highly sought after Diamond milling provides an unmistakable look and the flattest, most precise putter face in golf. The elegant Mid-slant hosel presets hands at address, and it's long thin design transmits detailed feel of putter head and face. Like all THOMAS Putter designs, the AT-40 includes the bi-level dual sightlines golfers have praised about. Aesthetically, the AT-40 putter is distinguished by a jealousy inducing Shot-Peened Champagne Chrome Plating, providing elite character, a crisp feel, and timeless durability.